Prior to his most exciting discovery, Waksman, a Russian-born American microbiologist, had been engaged in a study of soil microbes for a number of years. One of his students, French-born René Jules Dubos (1901-1981), was searching for antibacterial substances in soil. In 1939 Dubos discovered the first antibiotic drug, gramicidin. Although it fought pneumococcus, staphylococcus, and streptococcus bacteria, it was too toxic (poisonous) for use in humans. Waksman was inspired by Dubos's discovery. With the support of the Merck pharmaceutical company, he turned his attention to antibacterial substances found in soil. In 1941, he dubbed these substances "antibiotics." By 1958 he had discovered eighteen such drugs. Of these, streptomycin was the most important. Waksman isolated the antibiotic in 1943 and found it to be active against gram-negative bacteria. Eventually, streptomycin proved to be effective at fighting the tubercle bacillus. Because the tubercle bacillus can enclose itself in nodules in the body, it can remain dormant for years. When TB becomes active, it can strike any part of the body, but normally attacks the lungs. At the time Waksman developed streptomycin, the only treatments for TB were prolonged bed rest and nutritious food. 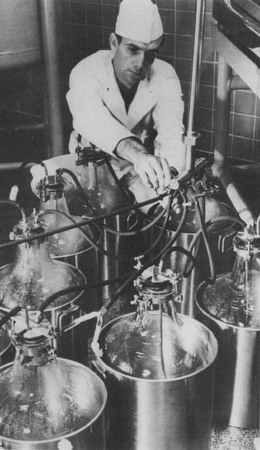 A man filters and subdivides streptomycin at the New Sterile Techniques Plant owned by Merck & Company. Pathologist William Hugh Feldman (1917-) and bacteriologist H. Corwin Hinshaw (1902-) conducted the first clinical trials of streptomycin against tuberculosis. Feldman and Hinshaw first tested streptomycin on guinea pigs infected with tuberculosis. They found the drug to be nontoxic as well as highly effective. By 1945 Feldman and Hinshaw had conducted their first tests of streptomycin in human tuberculosis patients. The drug arrested the bacteria and reversed the disease. Feldman and Hinshaw's studies showed that the antibiotic was effective against a number of different forms of tuberculosis. These included TB of the skin, bones, lung, meninges, joints, and genito-urinary tract. The side effects caused by the drug included impairment of the sense of balance and deafness. These side effects proved to be temporary and could be minimized by controlling the dosage of the drug. The Merck company agreed to turn over the rights for streptomycin to Rutgers University, which in turn licensed companies for production. In the late 1940s eight pharmaceutical companies began mass producing streptomycin. An estimated $1 million worth of the drug was provided for the largest clinical study of a drug ever undertaken, a study involving several thousand tuberculosis patients. Not only was streptomycin found to be effective and safe in treating tuberculosis, but eventually it was found to be active against 70 different types of bacteria which do not respond to penicillin including infections of the abdomen, urinary tract, pelvis, and meninges. Clinicians soon found additional drugs capable of destroying the TB bacillus. No less than 11 such drugs were isolated, providing physicians with a potent arsenal in the battle against TB. Using a combination of two or more drugs, doctors could strike at the stubborn microbes with great effectiveness. By the 1970s, the disease could be successfully treated in nearly all cases. Tuberculosis continues to be the most deadly infectious disease in the world. It attacks thousands of people in regions where adequate medical treatment is not available. Recently, concern about the return of TB has been voiced in the United States. Many victims of immune deficiency diseases such as AIDS have been infected with TB. In addition, physicians are concerned about the large number of TB victims who abandon their medical treatment before it is complete. Despite the effectiveness of drugs like streptomycin, acts like this keeps the disease alive and increase the chance of it spreading to others. I believe that Streptomycin saved my life in Manchester, in late 1946. I was one of only 2 or 3 very sick babies on the ward to survive an outbreak of gastroenteritis, upon which Penicillin had no effect. I would now like to find out more about the illness we had, and about the other one or two babies who survived. They would now be in thier mid-sixties. Can you tell me where to source the information? Streptomycin was very new at this time, and I believe the only babies to survive the illness were those treated with the "new" drug. will THE ANTIBIOTICS (today) still exist, with the limit capability, remind that mikcrobes are always mutate and be resistent..? Streptomycin is the reason I have been profoundly deaf since age 4. I never even had TB, just a severe throat infection. It is pathetic that the very real otoloxyc side effects were not emphasized in the early 50's and that warnings were not in place about administering it to young children. I was robbed of a normal life because of this drug. I am sorry Victoria that you happened to be affected negatively by this drug. My great-uncle is responsible for it's discovery. On the other hand I'm glad that Lynn Neary is alive today because of it. I had a very bad cancer, is it possible that this has to do something with tbc and the product strepto. Can you pls send me some information. Around 1948 or a maybe a few years later I had a bad infection that was almost magically cured in a couple of hours by an injection of which I remember the name in Spanish: Strepto Procacilina Rapilenta, the last word seems to be made of rapida(fast) and lenta(slow). Or it could have been: Stretoprocacilina, only one word. I guess that at a certain point it became inefective and may have been discontinued, but that must have been many years ago, and I wonder if the microbes' billionth generation still carry the immunization they acquired so many years ago. This idea does not seem particularly original, some experiments must have been done, or maybe not because of commercial reasons, God knows how intricate those business are, but I think they would be worthwhile to try the old antibiotics on new sicknesses. I was a TB contact in the early fifties and was subjected to injections of streptomycin for months, I was 6 I couldn't complain. Years after I heard on local TV that experimenting with strep at that time (50's) resulted in the death of hundreds of kids. I've tried researching the subject but can't find anything, anyone help? why streptomycin is prefered in children for treatment of tuberculosis? I was infected with spinal meningitis as a very young child in the 40's. I was treated at Children's Hospital in Philadelphia with Streptomycin. I thank God for this wonderful material. I was told that I was the first case of this type to be treated and cured with Streptomycin. Can this be confirmed? I had Potts (tb) of the spine when i was 18. I stayed in hospital for about 1 year. I had streptomicin shot every day. Then when I was released I got the shot 3 times a week on down until I was finished. I had to have bone morrows (very painful). Wore a cast for 5 months then a back brace for 2 years. When I was 25 I had cancer and had to have a complete hytorectomy. I am now 60 years young. The only problems I have is I have had a hard time with distance, balance and the ringing in my ears. But it has been so long ago, I have learned to adapt . I have had back surgery, but sometimes I worry about my bones and if they have seen any other side effects when you get older. Than you and I am thankful for the medicine they had to give me. ths. In 1949 I was treated with Strepto. And it cut my illness in half. I was hospitalized for 3 months. I was injected 3 times per day for 13 weeks. I was cured of TB. :-) I am very grateful. At the age of 4 years I had Infantile Paralysis (without the paralysis) - thank goodness! I have had breast cancer as an adult, I do not consider that Streptomyacin had anything to do with these other illnesses. I am now 75! I was born in April 1948 in Margaret Hague Hospital , Jersey City , NJ. I weighed 3lbs13ozs. My Twin brother was 6 1/2 lbs. We both came down with Dysentery. I was the test baby to receive streptomycin. I was told my pediatrician never took a dime and stayed with me for 24 hours to see if the drug worked. My mother said it was given to all the babies in the hospitals because dysentery spread in the hospitals, from world war 2. The Doctor’s last name was Brown. I am 70 years old and very healthy from a drug that saved my life and hundreds of other babies. My parents always told us the story of how our lives were saved. The doctor said I was a stronger baby. Even though I weighed 3lbs.